A bolt is a form of threaded fastener with an external male thread. 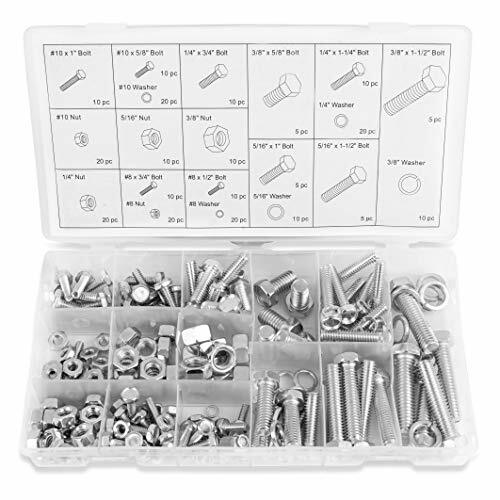 This 240-piece Nut And Bolt Assortment Includes A Variety of Bolts - Hex Nuts - Split Washers In Many Popular Sizes. The Set Can Handle A Wide Variety of Household And Automotive Applications. Comes with a PVC case that you can carry with you and has compartments for the various sizes. Keeps All Your Nuts, Bolts and Washers Neat and Organized. "Bolt Sizes: 10pc #8 x 1/2"", 10pc #8 x 3/4"", 10pc #10 x 5/8"", 10pc #10 x 1"", 10pc 1/4"" x 3/4"", 10pc 1/4"" x 1-1/4"", 5pc 5/16"" x 1"", 5pc 5/16"" x 1-1/2"", 5pc 3/8"" x 5/8"", 5pc 3/8"" x 1-1/2"" Hex Nut Sizes: 20pc #8, 20pc #10, 20pc 1/4"", 10pc 5/16"", 10pc 3/8"" Washer Sizes: 20pc #8, 10pc #10, 10pc 1/4"", 20pc 5/16"", 20pc 3/8"""
If you have any questions about this product by Ruddman Supplies, contact us by completing and submitting the form below. If you are looking for a specif part number, please include it with your message.